Botswana Ash (Pty) Ltd (BotAsh), the only extractor of soda ash in Botswana, is a 50/50 partnership between the Government of Botswana and Chlor Alkali Holdings (CAH) Group, a South African based company, which is also the management partner. Botswana Ash has a capacity of 300, 000 tons of soda ash per annum and currently produces over 280, 000 tons, making the country one of the largest producers in the world. Bulk soda ash is loaded at Sua Pan in Botswana and transported to the Natalspruit depot in South Africa. The railway logistics from Botswana to South Africa is managed by two service providers who are responsible for different legs of the route. Trains containing bulk product are offloaded into silos after arrival at the depot. Stock is then either dispatched to customers using bulk road tankers or bagged at the on-site bagging facility. The SADC offers an attractive export market for Botswana soda ash. Prices for soda ash vary according to each country. South Africa imports a significant volume compared to other regional countries at a price of over US$0.20/kg. Besides Namibia and Zambia, all other SADC countries pay on average above US$0.20/kg. 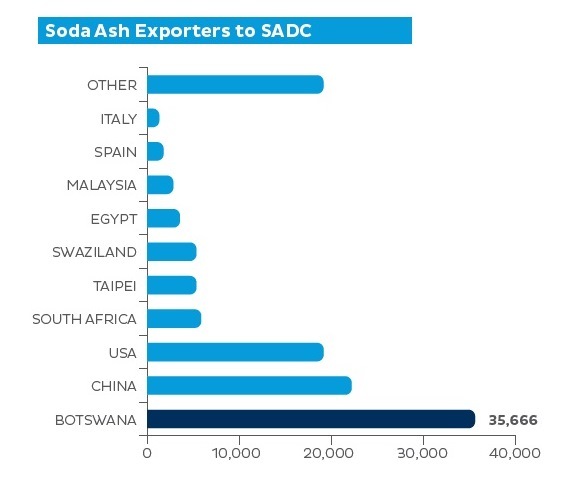 Botswana is the largest soda ash exporter to the SADC region. The country exports over 35, 000 tons to other SADC countries. Botswana soda ash is principally used by the glass industry. 66% of soda ash produced by Botswana Ash is sold to three major glass manufacturers in South Africa: Consol Glass, Nampak Wiegand (both for container glass) and PFG (for flat glass). An additional 20% is exported to Zimglass, a glass container manufacturer for the beverage industry based in Zimbabwe. Chemical products for which Botswana soda ash is used include anti-caking agents and cleaning agents. For the production of pure chromium, the iron has to be separated from the chromium in a two-step roasting and leaching process. The chromite ore is heated with a mixture of calcium carbonate and sodium carbonate in the presence of air. The chromium is oxidized to the hexavalent form used in stainless steel, other alloys and steel plating in the car industry. Soda Ash is widely used for the water treatment in swimming pools to increase swimming pool alkalinity (increase PH). The final product requires minimal processing and it is sold to consumers in packs of 500 gr – 4 kg. Set up operations nearby Botash’s South Africa depot to pack soda ash in consumer-ready pack sizes in order to satisfy the South African market. In Agriculture, Potassium fertilizers are commonly used to overcome plant deficiencies. Potassium chloride (KCl), the most commonly used source, is also frequently referred to as muriate of potash or MOP. Potassium chloride is the most widely used K fertilizer. Potassium is a mineral that is found in many foods and is needed for several functions of your body, especially the beating of your heart. Potassium chloride is used to prevent or to treat low blood levels of potassium (hypokalemia). a technology used to remove sulphur dioxide (SO2) from the exhaust flue gases of fossil fuel power plants. For example, in a typical coal-fired power station, FGD will remove 95-99 percent of the SO² in the flue gases. Similarly, large amounts of CO² are released into the atmosphere through power plants and industrial production processes (e.g. steel and cement production). 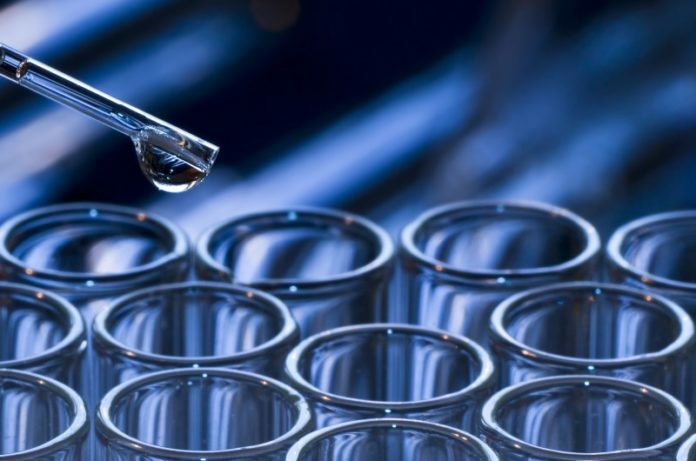 Recent research conducted by Harvard University and the University of Illinois have proved that micro capsules made of soda ash can absorb carbon dioxide. This is future opportunity for implementing technology across Southern Africa. To discuss opportunities in the soda ash industry, please contact the BITC (Botswana Investment and Trade Centre). These opportunities and estimates provided on this brief are calculated based on current available knowledge. Further investigation is recommended to evaluate the size of the opportunities in Soda Ash more accurately.